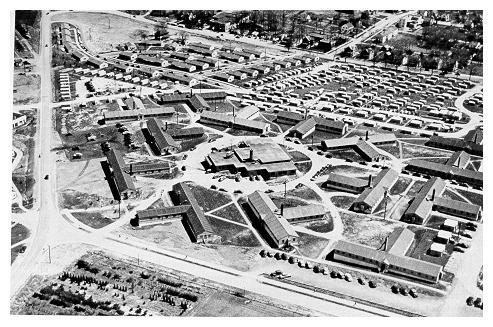 Student housing at Pollock Circle, Windcrest (upper right), and Eastview Terrace (upper left), Penn State University, circa 1948. To accommodate the influx of GIs after World War II, Penn State, like many other schools, obtained temporary government surplus buildings such as these trailers, formerly used by defense workers in New Castle, Pennsylvania. Known as "Windcrest," this settlement housed married students. The tiny trailers lacked plumbing and had living rooms with beds that folded down from the walls. Known as Nittany Dormitories, the units sat unpleasantly downwind of the poultry barns.